We used to attend silent Quaker meetings. They were great in many respects, not for me in others eventually. But one phrase the Friends use is "holding in the light." It means a few different things. Today, intermittently, I walked in the light. Morning starts early with dogs and vomiting on the floor. Oh well, that's what paper towels are for. Venturing outside, I noticed that the heavy fog of winter mornings was visiting. Always, always I again see my children as tiny little things running in the fog on mornings like this. Tea made, paper read, dog park! I rode my newly repaired bike -- but still have a hard time keeping up with Taz. I am The World's Slowest Rider still, apparently. 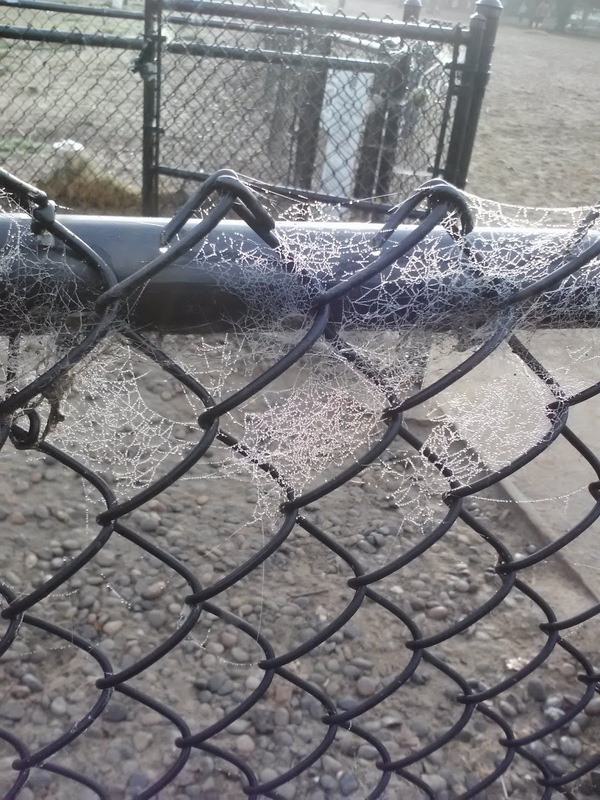 The fog had made art on the fence. 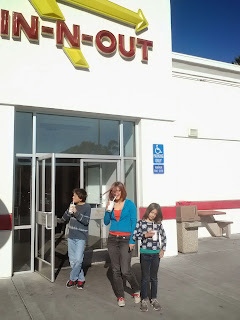 Later, I overheard the eldest child talking reasonably to the second one, a glow of light. Frisbee bake sale -- shining beautiful faces of the players -- leaving time for a dim sum lunch with the child who doesn't get good enough food in Oregon. The electric car stayed to charge in the municipal garage because the mulch blocks access at home; off for a favorite hike. As I step over roots and up and down rocks, the dog flings herself into the lake. We've been here so many times. Today, we walked widdershins around the water, so started in shadow. No sunglasses needed. But as we returned from the creek out-and-back, and started on the other side, warm sun broke through. Jacket off, eyes closed, face to sky. . . it glowed with thin honey light. A benediction on a winter afternoon, soon before sunset. Candles on the table, golden bubbling wine in glasses on the visiting child's last day. Frosting cakes and repairing old damaged woodwork aren't all that different, fortunately. Tomorrow, I sand. And roll pie crust, make more pie crust, and make and freeze pies and stuffing. Maybe I'll buy a turkey, too.